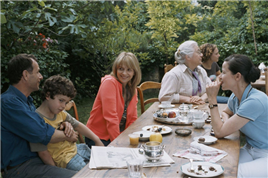 In Olivier Assayas’ uniquely poignant film, Summer Hours, we find ourselves at the charming country house of a bourgeois family just outside Paris. Cousins, from tiny tots to teens, are running pell-mell across the grounds, all but leap-frogging over each other on a treasure hunt. Two parents go for a walk in the woods, cut lilacs and kiss on a quiet hillside. The adult children pop open champagne to celebrate the 75th birthday of their mother, Hélène (Edith Scob). Meanwhile, looking sharp as a whistle, she gives candid instructions to her eldest, Frédéric (Charles Berling), for the occasion of her death. Each child should keep a remembrance, which she presents to them in turn, but beyond that, the 19th-century art works her uncle collected, and also his own notebooks and sketchbooks, should be sold to a museum. She has systematically itemized and documented them so as to arrive at their fiscal value, for though they have brought meaning to her life in the house, their pleasure for the family, she believes, stops with her. For the children they can only be a burden, with Adrienne (Juliette Binoche) working in New York and Jérémie (Jérémie Renier) in China and the little chance they have for making use of the house. Frédéric is beside himself with the thought of any of this — parting with the art collection, the estate, and, God forbid, his mother. One emotional thread of the film is the growing pains of the adults as they sever themselves from the family unit and their shared past by confronting the hard facts of the marketplace. For Frédéric, at least, it means his Treasure Island is gone. His daughter (Alice de Lencquesaing) remarks to her beau that she had planned to bring her children there one day, and a cherished déjà vu of a younger Hélène, picking cherries as her uncle paints, suddenly fills her gaze over the meadows, as if from a Nabi dream conjured out of memory, as she laments the loss of her grandmother. Ironically, Hélène has earlier observed to Frédéric that it’s not this place his children will miss — “It’s their childhood they love.” Children at the threshold of adulthood are really facing the idea of time, not only its racing and ceaseless chase across the world that can lead to a sense of transience, but also its family hourglass, through which pass history, memory, change, feelings, and (as Hélène claims) “secrets of interest to no one.” Time is also registered in place: land, buildings, objects. Then what is inheritance? Is it character, roots, and relationships, also bound up in a place? So what can objects mean, extracted from that living, breathing place? Can their beauty survive intact once they are transplanted in a museum? Do they suffer a private loss with a public gain? Summer Hours takes us on a museum tour in English with citizens of all the world peering at the Louis Majorelle writing desk once littered with life and the Hoffman cabinet Hélène used as a broom closet, now clean and empty and roped off for pristine viewing. Crowds over the ages might pass by for a rare glance at “beauty” or a chance to discover how other people have lived. What becomes clear is that it’s not answers Assayas is after in his film, but the genuine experience of ambivalence, or at least a kaleidoscope of viewpoints. He traces the fluctuations of 21st-century life as if they were the flight of a butterfly. As a writer he probes a web of complex themes heavy with global gravitas and personal loss, yet his dramaturgy is as swift and light as the season. Lively as the acting may be, with astute performances all around, bearing the intimacy of improvised exchanges from an ensemble of thespians he knows well, a melancholy hides in the wings, expressed tactfully and lovingly in the music of Robin Williamson and the viola, double bass, and Celtic harp of the Incredible String Band. Eric Gautier’s camera knows when to move and when to be still, ultimately capturing the blues in the light. This push and pull of seemingly polarized ways of presenting the film — heavy and light, fast and slow, moving and still, can be disarming. Along with breaks and gaps in the narrative, a peculiar rhythm emerges — restless, ironic, and often doubling back on itself in a reflexive way. The special life of objects comes to the fore as they are held in hand, used, turned over, and discussed before their relative “commodification” for restricted and ticketed display at the Musée d’Orsay. They are invested with an anthropomorphic appeal as we first experience them in their domestic habitat, one in which an artist lived and worked and loved, crafting his own expression day by day. Adrienne holds up a silver tray imprinted with the veins of a leaf, her heirloom from her mother, and tells her, “This tray appeared in my dream — it left me and returned to the pond in the woods to be a lily pad again!” The costumes and props of Summer Hours often feel like subjects with their own points of view: Adrienne’s Converse sneakers evoke a behind-the-scenes story of their production, distribution, and use. Immediate and tangible as the film’s setting may be, it is also thick with history, with off-screen economic and social relations scumbled upon each other as multiple layers of meaning. The hidden life of nature and artifacts haunts the human relations in the film. Surprisingly, the tension between the harmonious pleasures of the atmosphere, with its lush landscape and sensual habitat, and the crass path of the home and its art, “going under the hammer” of commerce and consumerism ,is a quandary that both beguiles and betrays its creator: Assayas, with his own fragmented ties to the past, may be telling the world to “move on” and settle in with the sweeping changes of our century, to sort out nature, art and property among the glistening shards of a new reality; but he is still the Francophile who avidly studied Impressionism and the classical novel and made Summer Hours as an acute postscript to his adaptation of Les Destinées Sentimentales, using much the same cast and crew and dappled light. In this sense, Summer Hours may be more about owning experience than owning property: experience that grows and transforms and spreads itself out as beauty, pleasure, creativity. "I hope that my painting will endure without craquelure. I should like to present myself to the young painters of the year 2000 with the wings of a butterfly," said Pierre Bonnard (an inspiration to the filmmaker) in 1946, a year before he died at the age of 80. 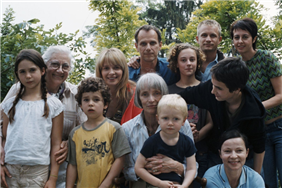 That Olivier Assayas saw his mother pass away just prior to shooting Summer Hours is abundantly apparent, for the work stands in homage to the beauty of her legacy. Director: Olivier Assayas; Producers: Marin Karmitz, Nathanaël Karmitz, Charles Gillibert; Screenplay: Olivier Assayas; Cinematography: Eric Gautier, A.F.C. ; Sound: Nicolas Cantin, Olivier Goinard; Editing: Luc Barnier; Sets: François-Renaud Labarthe; Costumes: Anaïs Romand, Jürgen Doering. Cast: Juliette Binoche, Charles Berling, Jérémie Renier, Edith Scob, Dominique Reymond, Valérie Bonneton, Isabelle Sadoyan, Kyle Eastwood, Alice de Lencquesaing, Emile Berling. Color, 35mm, 102 minutes. In French with English subtitles.